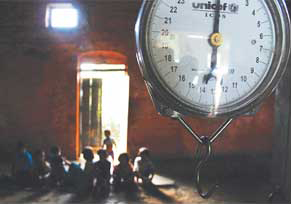 The efforts to reduce child malnutrition in Chhattisgarh have hit a roadblock. The state has partially rolled back its policy of decentralized food provisioning in the Integrated Child Development Services (ICDS), the key programme for reducing malnutrition amongst pre-school children. The National Family Health Survey (NFHS) shows that 47 per cent of children in Chhattisgarh are underweight, putting it along with Madhya Pradesh, Bihar, Jharkhand and Meghalaya, among the top five states in child malnutrition. A third of its children belong to the Scheduled Tribes and their condition is worse. An astounding 43 per cent adult women in Chhattisgarh are malnourished and only Bihar fares worse. No wonder nearly 40 per cent of the children are born underweight. These children face life threatening risks. Malnutrition causes more than half of the 35,000 infant deaths that occur in Chhattisgarh annually. Chhattisgarh became a state a decade ago and had made good progress in its initial years, even on the malnutrition front. The state achieved 8 per cent decline in its child malnutrition rate over a seven-year period while most of the nation remained stagnant and some states like Gujarat even registered an increase. Chhattisgarh also managed to reduce its infant mortality rate significantly in those years. These successes were largely due to its community health workers called Mitanins who mobilized the community around health and nutrition. The state also did a decent job of expanding ICDS coverage and had decentralized food provisioning in line with the Supreme Court’s orders. Around 10,000 women’s self help groups (SHGs) operating in villages were providing hot cooked meals for the pre-school children and dry rations for infants, adolescent girls and pregnant and lactating women. This year the state decided to go into reverse gear. It mooted the idea of going back to factory manufactured foods. Faced with stiff opposition, the state backtracked but still went for a partial rollback on decentralization. It took away the provisioning of dry rations from village-based SHGs and offered the contracts to richer SHGs that could cater to 25 or more ICDS centres at a time. This cut down the number of SHGs involved in dry rations by 90 per cent. The new SHGs are too distant to allow communities to monitor food processing. Now communities are not able to put any pressure even when the food supplies are irregular. The SHGs too are facing delays in receiving funds. These conditions are ideal for back-door entry of private contractors into ICDS and examples of this are already visible in Sarguja, Durg and Kanker districts. The dry rations provisioning to young children and mothers have broken down in most parts of the state. This year, the daily allocation per child was increased from Rs 2 to Rs 4. But most children in the state did not even get Re 1 worth of food. The hot cooked meals that the state was earlier proud of are also showing signs of distress. The food programme for adolescent girls has been closed down altogether. Chhattisgarh needs to stop violating the spirit of Supreme Court orders. Creating community control over the food distribution process had provided the initial success. Reverting to villagelevel SHGs and strengthening decentralization can help the state in taking its children out of malnutrition.